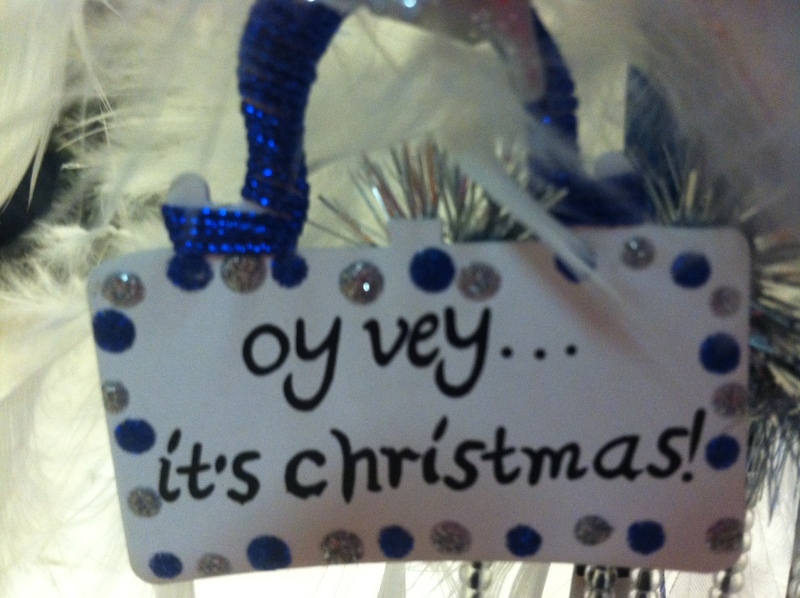 Catch My Words: Wordless Wednesday: Oy vey . . . it's Christmas! Wordless Wednesday: Oy vey . . . it's Christmas! Christmas time used to mean a trip to the Chinese restaurant, but these days us Jews work the Christmas light display at Shelby Farms. Have a Merry Christmas. Ho! Ho! Ho! Our best Christmas was a Feliz Navidad in Cancuun. Oy Vey it will soon be Boxing Day heheh! Signs off singing "Feliz Navidad Feliz Navidad Feliz Navidad"
Oy gevalt! Happy New Year! Chinese restaurant? You mean like in the movie, "A Christmas Story"? lol Do you have a son named Ralph? Very funny Cancuun. I wish you a Merry Christmas. I can totally get behind having Chinese for Christmas dinner! The cleanup alone makes it worth it! We all do what we have to do to get by these days. Working with lights sounds like an illuminating and joyful experience. Happy Holidays. Feliz Navidad is such a popular Christmas carol all over the world! Love it. The sign is lovely. I hope you have had a great day. Thanks for hosting. Merry Christmas! I had a Feliz Navidad in Cancun one year too, and it was awesome. Wish I were there this year! That blue decoration is so cool! Love the ornament! May the new year bring lots of joy! Hey, it's America and that's our charm. Feliz Navidad to you and yours. Sounds like you had a "super sparkly" day! Previous years was Chinese food and movies with fellow Jewish friends, but this week it was a quiet day at home in the rain. Glad you had a good one! I'm kind of celebrating my holidays in January with a one week vacation in Las Vegas where I'm doing the Consumer Electronics Show and seeing lots of Vegas stuff. Have a great New Year! Great image! Hope you had a great holiday. Cancun sounds great. Though I can't complain since I spent Thanksgiving this year in the Bahamas. I am so swipping the Oy Vey picture! Oy vey, I love it! I hope you had a happy Hannukah and a great holiday season! Happy Holidays.. love the song. Happy WW! Here's to some awesome photos! Feliz Navidad in Cancun sounds wonderful! Happy Holidays! LOL.. No Chinese food around here; but I do like the song and now I keep coming back to it. Hope you had a happy Hanukkah. Hope you had a wonderful Christmas and Hanukkah! And yes I had a Christmas in Cancun myself many moons ago,it's FANTASTIC and I much wish I was there right now instead of being snowed in! Thanks for the linky, and the visit today, Happy WW! Beautiful Christmas cards, I like those beautiful images. Hope you had a Happy Hanukkah! Thanks for your comments on my site! May you have a very blessed New Year! Haven't had Chinese food in years, sure would love some good choices, none exist around here. There are things I miss from living in the city, not enough to move back though. We have our Chineses on New Years. Your post was funny. Oh, I love that song! Now you'll have me singing it all day long. Yes, way too often thought this. Please have a good Friday. Love the song and thanks for dropping by my blog. Didn't know you hosted a wordless wednesday. Will update my Christmas post and join in from now on. Love the decor! Thanks for sharing such a fun holiday song. Appreciate you stopping by to link up! See you again next Wednesday.